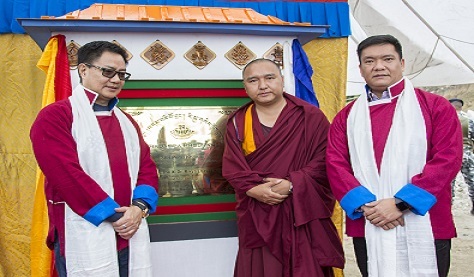 Chief Minister Pema Khandu on Monday laid the foundation stone of Phadampa Phodrang here at Lhou village in presence of MoS Home Affairs Kiren Rijiju, RWD Parliamentary Secretary Jambey Tashi, Tawang MLA Tsering Tashi and Dr Rikya Lhavoe Rinpoche. MoS Home Kiren Rijiju and Dr Rikya Rinpoche also spoke on the occasion. A book authored by Dr Rinpoche ‘Advice on repaying the kindness of parents’ was released by Rijiju.